Photoshop 7 has more than 460 menu items in the main menu. Additionally it has 15 feature-rich tool palettes including the Tools palette with 60 tools; plus it offers a plethora of tool presets, color swatches, actions, blend modes, and much more. Wow, you might think: How am I going to learn all about all that stuff! The fact is if you configure Photoshop 7 properly and you learn to use the tools that you need to use — it really is possible to do all that you'd like to do, without having to learn about everything. This first technique covers all the necessary steps you should take to set up Photoshop 7 — for you and what you want to do. ■ Choose File ^ Open (Ctrl+O). After locating the \01 folder, doubleclick it to open it. Click iris.jpg and then click Open to open the file. Before you begin configuring Photoshop 7 to best fit your working style, I ought to point out that monitor screen resolution and color quality settings can be changed. If you know about these settings and you know how to use them, then skip to Step 3. Otherwise, this is a step worth carefully reading. I know many competent PC users who were not aware that they can change these settings and were pleased to learn about them — especially those with aging eyes! ■ If you are using Windows, right-click anywhere on your desktop where there are no application windows or icons to get a menu. From the menu that appears, select Properties to get the Display Properties dialog box. Click the Settings tab to get a dialog box similar to the one shown in Figure 1.3. Toward the bottom left of this dialog box, you see a slider in the Screen resolution box. Depending on your display monitor and your graphics board, you have one or more choices of screen resolutions as you move the slider. 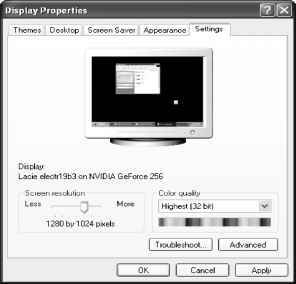 ■ Choosing the best screen resolution setting depends on several factors such as: monitor size, graphics card capabilities, available graphics card RAM, your eyesight, and current work at hand. Most new computers allow you to change screen resolution on-the-fly, meaning that you do not have to reboot your PC each time you change screen resolution. If your PC allows on-the-fly changes to your display, then you may want to consider changing often to suit your immediate needs. At lower screen resolutions, such as 800 x 600 pixels, or 1024 x 768 pixels, everything is relatively large including text, application menus, and application windows, making them easy to see and read. However, the downside is that you have less workspace. This means that you can see less of a large image, or if you have two or more applications open and viewable on your desktop at the same time, you have less room to display the applications. Even more importantly, you see less of the image you are working on if you have lots of tools and palettes open as you work. ■ After you have decided what screen resolution to use, click the slider and drag it to the left or right until you get the setting you want. For most Photoshop work, I like to use the 1280 x 1024 pixels setting when I use a 19-inch or larger monitor. ■ After setting screen resolution, make sure to check the Color quality setting — it must be set at 24-bits or higher. 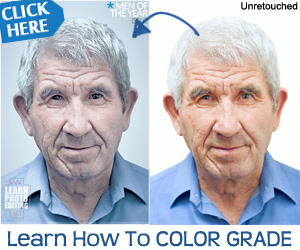 Anything less and you have way too few colors to effectively edit digital photos. If your graphics board does not have enough video RAM to display 24-bits of color at a high screen resolution setting, then you may have to choose a lower screen resolution setting to use 24-bit color. ■ After your choice of screen resolution has been selected and you have 24-bit or higher color quality, click the OK button to apply the settings. You then likely see your display flicker as it changes to the new settings. If you get a dialog box saying that you have to reboot your PC, first save any open documents, and then click OK to reboot your PC. One of the many benefits we have in today's Internet-connected world is always having access to up-to-date software. Many of the new products by Adobe, such as Photoshop 7, have a built-in update feature, called Adobe Online Update, which is a terrific feature that you ought to use! updates! If there are no updates, or you choose not to install available updates at this time, click Close. Besides manually checking for updates as in Step 3, you can also configure Photoshop 7 to check for updates automatically. ■ Choose Edit ^ Preferences ^ Adobe Online to get the Adobe Online Preferences dialog box shown in Figure 1.5. Here you can select how frequently you want Photoshop 7 to check for updates. Click the down arrow in the Check for updates box to choose Once a Day, Once a Week, or Once a Month. Click OK to apply the settings. Adobe engineers have made Photoshop 7 easy to use by making sure that most features have default settings — this means you can just use features and not worry about having to select options each time you use them. The approach they took was to put most of these default settings into several preference files and the Registry, which can be accessed from a series of dialog boxes. We go through each of these dialog boxes in the next step. Before then, I suggest that you first restore your preferences to their default settings. PI hk 1 h H"
makes it easier for you to end up with the suggested settings. ■ If you are using Windows, you can restore the preferences file by pressing and holding Alt+Ctrl+Shift immediately after launching Photoshop 7. 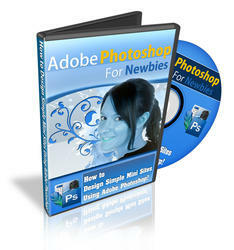 You will get a dialog box asking if you want to delete the Adobe Photoshop Settings File. Click Yes after asked if you would like to delete the settings file. ■ If you clicked Yes, after Photoshop 7 loads, you will get another dialog box asking if you want to customize your color settings now. Click No to continue loading Photoshop 7 as we get to the color settings later in this chapter in Technique 6. Photoshop 7 has eight Preferences dialog boxes with lots and lots of changeable options. Not to worry! I am making a bold assumption that you are configuring Photoshop 7 for editing digital photos and that your printer is a consumer-grade digital photo printer. We just cover those options that you are most likely to need to make sure they are set for these purposes. The rest we can just skip over! While you may not want to make any changes to the preferences file at this time, taking a quick tour through these screens to see what is available can be worth your time. A simple change in one of these settings often makes your work considerably easier and quicker, and in some cases remarkably better. ■ Choose Edit ^ Preferences ^ General (Ctrl+K) to get the Preferences General dialog box shown in Figure 1.6. ■ Leave History States set to 20 for now, but it is important that you are aware that this feature can gobble up RAM in huge bytes (or I should say bites!). In Technique 4, you find out more about history states and how it impacts the use of RAM. Now you know where to come to change the setting for number of states should you find your PC is struggling with huge working files. ■ The Beep When Done feature is nice to use if you have a slow PC or frequently work with large files. If you find yourself looking at the screen for long periods of time to see when Photoshop 7 has finished a task, turn this feature on. Otherwise, turn it off so that you don't have what to some might be considered an annoying beep. This feature is smart enough to not beep all the time; rather, it just beeps when Photoshop 7 takes a few seconds or more to complete an edit or open a file. I leave it turned on.